In my last post I stated that the “re-thinking and re-designing of the organisation for the digital age” has come a long way but still needs further refinement regarding to the strategic recommendations. The key challenges are still the change of mindset, the individual adaptation of new forms of working as well as the change of the overall organization and the leadership model. While the technology is not seen as any challenge, it still plays a key role for enabling the change and re-designing of the organization. Bringing the dots together for the enablement and support of new working and sharing approaches is the overall “d’accord” regarding the digital workplace strategy. The integrated digital workplace is seen thus as the new “big trend” – as Dion Hinchcliffe also stated at the Digital Workplace FORUM. But as we have already talked about this in the past, there is still a need to be more precise what this means. In the following I want to outline two aspects that add to this need and are being discussed at the Enterprise Digital (Workplace) SUMMIT in London in June. Sure thing – employee centricity must be more than just a phrase or a feature for the digital workplace. Certainly it needs to be an leadership attitude and cultural value – but at the end it must be also incorporated in the processes, working routines and working support. 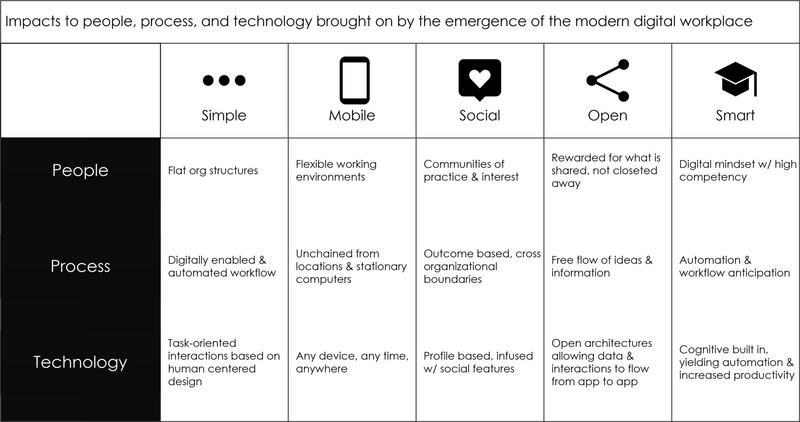 One key aspect of modern digital workplace approaches is the light-weighted, easy-to-use and pleasant user interface. It’s the old idea of a good user-centric experience driving the adoption and the use of the application for getting things done. Especially when the ease-of-use is enabling complex interactions and processes. Therefore employee centricity is about focussing on the biggest impact and support for the employee productivity and engagement. The ways of supporting productivity and engagement is certainly dependent from the type of work and use cases that a key for the organisation and thus vary very much. At our upcoming Enterprise Digital (Workplace) SUMMIT we are discussing once more lessons learned from various organisations (see the list of speakers) with the establishment of new digital supporting forms of work. Different types and ways of technological approaches are being discussed – from standalone Facebook @ Work to integrated O365 approaches as well as “Intranet in a Box” approaches on top of “Cloud Office” solutions. We will be trying to discuss and work out the distinguishing as well as determining factors for each solution approach and the context and conditions in which in provides the best support of work. What are the metrics for tracking and analysing the change in the improvement of work routines? How can we relate the metrics of improving the work routines (in regards to productivity, increase of information transparency, engagement etc) to the change of the organization? How can we drive the further change from these insights? Many of these question also adress the topics from the field of HR Analytics and People Analytics. Especially the question on how to relate the digital workplace data to the overall transformation and change will be addressed mainly in our November edition of the Enterprise Digital (Workplace) SUMMIT. We are very much looking forward to the upcoming events – also being grateful for the fine line-up of speakers with Jane McConnell and Dion Hinchcliffe giving the introduction notes and a diverse list of corporate project leads form Bank of England, EDF Energy, COWI, Bureau van Dijk, Charles Taylor and Towergate Insurance providing insights to their projects. Do not miss the event on 6 June at the Britisch Academy – and get your ticket today!